Pella Corporation, a window and door manufacturer, reduced releases and transfers of 33/50 Program chemicals from 896,300 pounds in 1988 to 151,750 pounds in 1994, an 83 percent decrease. These reductions were achieved primarily by eliminating solvents from adhesives, paints, and cleaning processes. This Success Story focuses on an innovative method to reduce and potentially eliminate chromium releases by using carbon adsorption to recover chromium from industrial wastewater. Pella Corporation, founded in 1925, is a privately held company that manufactures windows and doors (SIC 2431–Millwork). Known for years as the Rolscreen Company, the business grew on the strength of the residential housing market. In 1990, the company changed its name to Pella Corporation. recognized building supply retail outlets. Pella also serves architectural firms by designing and manufacturing custom windows and doors at its plant in Shenandoah, Iowa. Pella employs approximately 3,500 people. 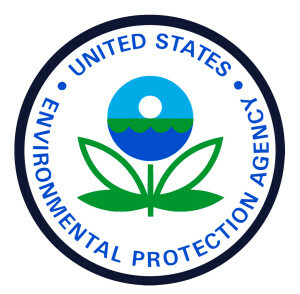 Pella’s management initiated the efforts to join the 33/50 Program in 1991 and established a goal to significantly exceed EPA’s 33/50 targets by reducing 33/50 chemical releases and transfers by 90 percent by 1995, using 1988 as the baseline year. The company reduced 33/50 chemical releases and transfers by 65 percent in 1992 and by 83 percent in 1994. This was accomplished by switching to non-solvent-based adhesives; selecting high-solids paints; eliminating perchloroethylene emissions by replacing one vapor degreaser with an aqueous parts washing system and eliminating the need for a second vapor degreaser by changing the materials used in window manufacturing; and eliminating methylene chloride emissions by simplifying a glazing production process. exterior. Aluminum extrusions are processed through a five-stage chromium conversion process prior to adding a durable paint finish. Wastewater from this process contains hexavalent and trivalent chromium. In the past, the wastewater was treated by an in-house wastewater plant using a standard chromium reduction/chemical precipitation process. Consequently, a chrome sludge was produced and disposed of in accordance with the requirements of the Resource Conservation and Recovery Act. Effluent wastewater was regulated under a pretreatment agreement with the local POTW. The total annual cost of operating the wastewater treatment system was approximately $187,000. learned about a metals recovery and recycling process developed by Lewis Environmental Services, Inc. (LES) of Pittsburgh, Pennsylvania. The recovery system utilizes granular activated carbon with a proprietary conditioning pretreatment to enhance heavy metal adsorption, combined with electrolytic metal recovery to produce a valuable metallic product. LES has a patent pending for this system, which is called the Enviro- Clean process. Pella requested LES to demonstrate the applicability of the process to chromium. Additional sampling was done to characterize the wastewater and a treatability study was conducted. It became apparent that a properly designed system would meet the following goals: (1) reduce or eliminate chrome sludge; (2) recycle wastewater back into conversion coating rinses; (3) achieve cost savings by reducing chemical purchases and hazardous waste disposal. LES designed and built a system consisting of two adsorbers operating in series. A schematic of the system is shown in Exhibit 1. Influent wastewater flows into a 500-gallon surge tank equipped with chemical feed mechanisms used to adjust the pH to approximately 4.5. Wastewater is pumped through the primary adsorber, where more than 90 percent of the chromium is removed. Since the pH tends to rise slightly as the wastewater flows through the primary adsorber, a midstage pH meter and chemical feed maintains an optimum pH as wastewater moves into the secondary adsorber. Operators monitor the chromium concentrations of the influent, midstage, and the effluent twice per 10-hour shift to determine system effectiveness and performance. Once breakthrough occurs in the primary adsorber, it is sent offsite for regeneration and replaced by the secondary adsorber, which in turn is replaced by a recently regenerated adsorber. The first phase of the project, which began in November 1995, involved equipment installation and startup. Initially, wastewater from all five stages of the aluminum conversion coating process was treated with two adsorbers operated in series. However, because the rate of aluminum carryover was higher than expected, an aluminum hydroxide precipitate formed in the surge tank and subsequently accumulated in a layer that restricted flow to 8 gpm in the first adsorber. Therefore, plumbing modifications were made so that in the first project phase, only rinses from the fourth and fifth stages were sent to carbon adsorbers while wastewater from the other three stages was treated by conventional chromium reduction/precipitation. The rinsewater flows from the fourth and fifth stages had chromium concentrations ranging from 60-80 mg/L and flowed at 15 gpm for one 10-hour shift per day. In addition, the influent pH was lowered to 4.0 in order to minimize aluminum hydroxide precipitation, maintain normal flow rates, and still achieve a chromium removal rate of 99 percent. Under this configuration, the system removed more than 99 percent of the chromium. Chrome sludge disposal was reduced by 32 percent during the first phase of the project. The second phase, which began in May 1996, involved plant modifications to incorporate additional wastewater flows from a second chromium conversion line and to capture the midstage rinse following the third stage. 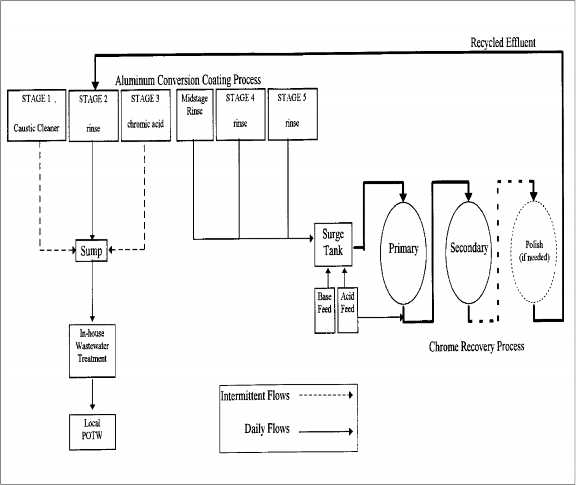 After completing the modifications, the influent concentration of chromium increased significantly to 200-500 mg/L, the flow rate increased to approximately 27 gpm, and the effluent was recycled back into the production process. Due to the higher chromium loadings, three adsorbers were run in series in order to achieve the desired chromium removal rates. Significantly reducing and potentially eliminating chrome sludge disposal. The recovered chromium material is sold to industrial users and completely spent carbon is sold as feedstock to steel manufacturers. Lowering operating costs. Implementing the carbon adsorption system generated an annual cost savings of approximately $77,000, due primarily to reduced purchases of the chemicals used in the traditional reduction/precipitation process. The company estimates that the payback period for the initial investment in the carbon adsorption system will be less than two years. Recycling effluent. The company consumes less water by recycling the effluent for use in a rinse stage earlier in the aluminum conversion process. Increasing operational flexibility through a modular design. The company can continue to adapt the system to accommodate changes in their production needs. Occupying less floor space than the traditional wastewater treatment system. Pella perceives the potential to adapt the carbon adsorption system in the future so that it can be used to treat all of the wastewater from the aluminum conversion process and virtually eliminate chrome sludge production. Due to the high concentration of dissolved aluminum in wastewater from the first two stages and the resulting precipitation of aluminum hydroxide in the surge tank, this adaptation presents some technical challenges that are currently being investigated by Pella. The rinse water stream contained heavy metals, namely silver, copper and nickel. Also, cyanide was present in this stream, which normally would require several treatment steps to destruct this type of chemical. The desired recycling process must produce a low level heavy metal, cyanide and dissolved solids effluent. Targets concentrations were cyanide levels <10 ppb and heavy metals levels <100 ppb. 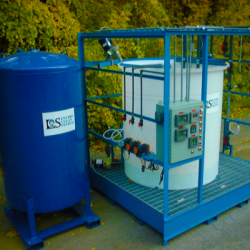 Leading Technologies requested Lewis Environmental Services, Inc. to conduct a field demonstration test for the destruction of cyanide and the removal of silver and copper from a cyanide rinse stream generated at their plant located in Leechburg, PA. The purpose of the test was to demonstrate the viability of simultaneous destruction of cyanide and heavy metal removal with granular activated carbon, known as Lewis’ ENVIRO-CLEAN PROCESS. A cost estimate for a full scale system was to be determined based on the results of the field demonstration test. The variations in silver and copper feed concentrations were minimal over the length of the test. The average feed concentrations for silver and copper were 1.05 mg/l and 0.27 mg/l respectively. Over the test period, the cyanide concentration ranged from 10 mg/l – 0.5 mg/l with an average cyanide concentration of 6 mg/l. The averaged effluent ENVIRO-CLEAN PROCESS concentrations for cyanide, silver and copper were 0.01 mg/l, 0.009 mg/l and 0.005 mg/l respectively. The carbon system’s removal efficiency was 99.8% for cyanide, 99.1% for silver and 98.1% for copper. Also, the spent carbon passed the hazardous waste characterization (TCLP Test). Verifying the spent carbon filters could be transported as nonhazardous material. Leading Technologies contracted with Lewis Environmental Services to supply and install a full-scale system. The full-scale system was designed to process 80 gpm of cyanide bearing rinse water from a high speed electroplating operation. The system was supplied pre-piped and skid-mounted. It required a fairly small foot print; approximately 8 ft. by 24 ft. floor space. Total system price was approximately $200,000. The effluent was not recycled the first two weeks operation until the plant verified that the effluent quality was suitable for recycle back to the process. The unit removed the heavy metals to non-detection and provided complete cyanide destruction from the outset. Plant personnel reviewed the effluent analysis data and unanimously confirmed that the effluent quality was suitable for recycling and initiated effluent recycling to the rinsing stations. Over a seven month period, the average recycle rate has been approximately 35 – 40 gpm. The comprehensive sampling program has continued for the length of operation. The average feed concentrations for cyanide, silver and copper were 2.1 mg/l, 0.27 mg/l and 0.55 mg/l respectively. For the same time period, the average effluent concentrations for cyanide, silver and copper were non-detection to <0.01 mg/l. The system processed in excess of 5,500,000 gallons of water before requiring its initial filter change out. The prior , Leading Technologies utilized in excess of 72 million gallons of water annually for their process, since installation of the LES system Leading Technologies has realized a reduction in water usage to 41 million gallons annually. That is real water savings of over 31 million gallons annually. The economics of the water recycling drastically improved because the local water authority increased sewer rates by 30% the next year. 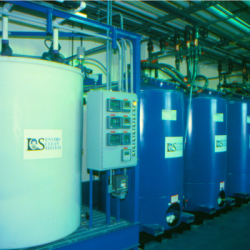 The proprietary treated activated carbon system simultaneously destructed cyanide and removed heavy metals from a rinse stream. The ENVIRO-CLEAN PROCESS produced an effluent of high purity, suitable for recycling on computer component electroplating line. The activated carbon demonstrated it’s capability to remove heavy metals with average removal levels for silver and copper of 99.1% and 98.1% respectively. The system produced average silver and copper effluent concentrations of 0.009 mg/l and 0.005 mg/l respectively. The system simultaneously destructed the cyanide to non-detection levels with a 99.8% removal level. The average cyanide feed and effluent concentrations were 6.0 mg/l and 0.01 mg/l respectively. The effluent was crystal clear at all times and exhibited no color. This effluent was directly recycled to the production line at the primary rinse station(s). Actual water savings on a yearly basis combined with the chemical and sludge savings yields a total operating savings of $249,197 per year! No single technology on the market today has the been commercially demonstrated to remove heavy metals, catalytically destruct cyanide and recycle water and reduce chemical usage and sludge disposal cost. Also, this system offers the customer a real pay back period in 0.8 years. A Comprehensive Report detailing the Effectiveness of Chromium Removal via the ENVIRO-CLEAN PROCESS; a Patented Technology. National Steel is interested in significantly reducing the generation of hazardous waste from its finishing operation located at Portage, IN. Recently, Midwest replaced its cyanide based plating solution with a MSA based bath at the tinmill. This left chromium as the sole hazardous waste constituent generated from the plant. Also, a new acid pickle recycling service was installed which affected the chromium waste treatment process. Prior treatment practices consisted of blending of chrome waste with waste pickle acid. This change required National to purchase chromium reduction chemicals (meta-bisulfite) at an annual cost in excess of $300,000 per year. The treatment chemicals reduced the hexavalent chromium to a trivalent form, which was then precipitated at the chrome waste treatment plant. The resulting 35 million pounds per year of hazardous chromium sludge was disposed of on-site at Midwest’s captive land fill. This hazardous waste generation/disposal situation has existed for numerous years. A $10,000,000 capital appropriation is planned for a new chrome treatment plant to replace the outdated system. The pending new treatment plant is designed for a flow rate of 600 gpm. To add insult to injury, the planned new treatment plant maintains the status quo and does not offer Midwest any benefits, such as elimination of hazardous waste generation via chromium recovery and/or water recycle. Current waste treatment and disposal costs are approximately $1,800,000 per year which does not include National Steel’s corporate environmental liability for potential cleanup of the land fill. Lewis Environmental Services (LES) has developed an innovative remediation approach to National Steel’s chromium waste streams utilizing the ENVIRO-CLEAN PROCESS. This new patented process adsorbs heavy metals from liquid waste streams onto a bed of granular activated carbon containing a proprietary chemical treatment. When the granular activated carbon is fully loaded, the concentrated heavy metals are stripped from the granular activated carbon and recovered with an innovative Electrolytic Metal Recovery (EMR) step. This process is superior to the existing state of art for treating heavy metal wastes from steel strip finishers because a recyclable EPA quality effluent is produced, no hazardous waste is generated and a salable metallic by-product is recovered. This report will discuss the results obtained from a 90 day “chem treat” chrome removal trial conducted at National Steel’s Midwest Division plant located in Portage, IN. LES installed and operated a modular chrome removal system rated for 20 gpm. The unit processed a slip stream from the chem treat waste area and its operation matched the tin line production schedule. A flow schematic of the process is presented in Exhibit 1.0. The next section will discuss the completed engineering study. The overall objective of the engineering study was to demonstrate the effectiveness of the ENVIRO-CLEAN PROCESS to treat tinmill waste under continuous operating conditions over an extended period of time. This study was conducted with a commercial sized equipment package and at flow rate range(s) to verify the technologies performance capabilities to remove chrome under real in-plant conditions. The study’s objectives were: (1) monitor effluent quality over the course of the study to ensure it would met state and federal discharge limits, (2) verify that the effluent could be recycled back to the “chem treat” line and (3) determine the system’s level of chromium removal from the waste stream..
A daily sampling program was initiated with samples collected at 0700, 1600 and 2200 hours (military time). The sampling locations were: (1) the raw chem treat rinse line before it entered the system feed tank, (2) effluent – activated carbon filter #1 (EFF #1) and (3) effluent – activated carbon filter #2 (EFF #2). Analysis included: chromium (hexavalent and total), suspended solids, conductivity, total iron, oil and grease and pH. The unit was operated to match the tin line’s production schedule and outages. Samples of the raw chem treat rinse were collected during each sampling period. The variations in chromium concentrations (total and hexavalent), conductivity, iron and pH were significant over the course of the trial. The three runs had widely varying concentrations for the above listed constituents. The ratio of hexavalent to total chromium concentration was nearly 1.0 over the course of the three runs, which indicated that hexavalent chromium was the primary species present. Table 1.0 list the constituent analysis (high, low and average) for the three runs. The chromium engineering study utilized a carbon removal system which consisted of a feed pump, tank, conductivity meter, pH controller, cartridge filters and two carbon adsorber units in series. Each filter contained 2,000 pounds of proprietary treated granular activated carbon. The system was skid mounted, prepiped and wired. 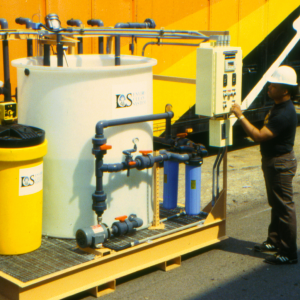 A slip stream from the total chem treat waste stream was process by the Lewis system. The flowrate averaged approximately 15.0 gpm. The chem treat rinse stream was adjusted with 20% sulfuric acid or 20% liquid caustic to a pH range of 4.0 – 4.2. The treatment parameter values were based on positive results obtained from previous chromium removal projects. Lewis supplied a technician to operate the unit during daylight hours and Midwest line personnel collected samples on the back turns. Raw feed and effluent samples were collected and analyzed based on the above mentioned sampling program. The chem treat rinse stream was processed with minimal mechanical or process difficulties. Effluent samples were crystal clear and water white. Two carbon filters were replaced during the course of the trial. The test started on October 23, 2000 and was terminated on January 04, 2001. A total of 304,800 gallons were processed during the trial. Presented in Exhibit 2.0 is the complete analysis list of the feed and effluent samples, including date and collection time periods. This section will discuss the operational observations and performance of the chrome trial. The system was operated with two carbon filters in series. The system was shut down when the primary (lead) carbon filter exceeded its capacity to continue removing chrome from the rinse water stream while the secondary (polish) filter still produced an effluent hexavalent chromium concentration <0.01 mg/l; this completed a run. The next run continued with the secondary filter moved up to the primary (lead) position and a fresh carbon filter placed in the secondary (polish) position. Three runs were completed over the length of the study. The final effluent from Lewis’ carbon system was discharged to the chem treat clean water rinse section. No adverse effects developed with finished coil quality. Feed and effluent samples were collected each turn and analyzed for: total and hexavalent chrome, iron, conductivity and pH. Exhibit 2.0 list the individual test results for the various constituents observed over the three runs. Table 2.0 lists the maximum, minimum and average values for the various constituents over the length of the trial. Presented below are discussions highlighting the performance of each run. Run #1 – October 23, 2000 through November 13, 2000. This run lasted seven turns and processed 58,800 gallons of raw chrome waste. This run had the highest average total chrome concentration over the entire study at 404 mg/l. The system maintained an average effluent hexavalent chromium concentration of <0.01 mg/l and average total chrome concentration of 0.16 mg/l. A small cartridge prefilter was installed upflow of the carbon adsorbers. It contained suspended solid material after several days. Samples of the suspended solids and spent activated carbon from the first replaced filter were collected and sent out for analysis. Run #2 – November 11, 2000 through December 6, 2000 . During this 26 day period (including 5 day shutdown for Thanksgiving) the system operated 20 turns. A total of 144,000 gallons were processed during this time. This run had the lowest average raw chrome feed concentration and conductivity values observed over the three runs. The total chrome and conductivity values were 86.79 mg/l and 358µmhos/cm respectively. Also, a heavier coil coating oil was used for Kosher products during the second half of the run. Oil solids were observed in the raw waste stream and presented some processing difficulties. Run #3 – December 11, 2000 through January 4, 2001. During this four week period (including 12 down days for Christmas thru New Years) the system operated 17 turns. A total of 102,000 gallons were processed during this time. This run exhibited the second highest average raw total chrome concentration of 173 mg/l. The ENVIRO-CLEAN PROCESS produced low concentration levels of total chrome and hexavalent chrome. Based on all three runs, the averaged effluent concentrations for total chrome and hexavalent chrome were 0.50 mg/l and 0.016 mg/l respectively. The carbon system’s removal efficiency was 99.0% for total chrome and 99.9% for hexavalent. This quality effluent would be suitable for direct discharge or possible recycle to a demineralizer system. Also, the carbon system was very effective in the capture of total iron with removal levels in the 99.4% range. This technology could be used to polish other iron bearing streams in the mill. Graphs of the heavy metal constituents are presented in Exhibits 4.0, 5.0 and 6.0 respectively. Impact of Oil and Grease – There were 48 sampling periods with five final effluent samples exceeding the hexavalent chrome discharge level of 0.01 mg/l. Review of the operating data revealed that these excursions occurred during the second half of run #2, when a heavier coil coating oil was used for Kosher products. Considering no oil pretreatment process was in place, the carbon system processed normal coil coating oil exceptionally well, producing a low parts per billion effluent. Not withstanding, oil and grease pretreatment is a must for the full-scale system. Suspended Solids Analysis – A sample of suspended solids material was collected from the cartridge filter(s) during run #1 and sent out for analysis. The sample was dark brown in color and assumed to be iron. After testing, it was determined that the solids were a combination of iron and chrome. Analysis revealed that the sample contained total iron and chrome concentrations of 11,800 mg/kg and 66,700 mg/kg respectively. It’s believed that the chrome solids precipitated during the electrolytic coating on the coils or chem treat process and ended up in the waste stream. Suspended solids pretreatment before the carbon filters will be required. The chrome removal loading for each run was calculated by dividing the total pounds of chrome removed that run by the pounds of carbon in the filter (2,000 lbs.). Over the three runs, the primary carbon filter adsorbed 186 lbs, 100 lbs and 149 lbs respectively as pure chrome. The chrome removal mass loadings percentages for runs #1, #2 and #3 were 9.3%, 5.0% and 7.5% respectively. A total of 304,800 gallons were processed. Based on past experience, the trial demonstrated excellent performance with chrome removal loadings of 5.0% – 9.3% while meeting <0.01 mg/l hexavalent chrome effluent concentrations. Chrome removal loadings of 5% – 7% are considered above average to superior levels for metal adsorption applications. Presented in Exhibit 3.0 is the chrome removal loading data. Review of the operational data showed that for runs #1 and #3, the second filter adsorbed approximately 10.2 pounds of chrome in the polishing position. Run #2 with the heavier coating oil removed only 8.4 pounds of chrome, which was a 18% reduction. If the negative impact from the heavier oil was removed and assuming similar chrome removal loadings as in runs #1 and #3, run #2 would have processed an additional 94,000 – 117,000 gallons of chem treat waste, based on an average raw chrome feed concentration of 87 mg/l. Spent Carbon Analysis – A sample of spent carbon was collected from the first replaced filter and sent to an outside firm for TCLP analysis. The spent carbon exhibited an oily smell and the carbon granules where tacky and stuck together. The carbon sample passed the TCLP test after washing with clean water (2 bed volumes) to remove high concentration chrome water from the carbon’s pores. The chrome concentration in the TCLP test solution was 1.7 mg/l; a pass is any chrome concentration <5.0 mg/l. Exhibit 7.0 lists the TCLP test results. Lewis Environmental Services demonstrates mobile recycling process at West Virginia deep well injection site. Pittsburgh, PA, July 05, 2011: Lewis Environmental Services, Incorporated processed and recycled Marcellus Shale hydraulic fracturing waste water slated for disposal at a deep well injection facility located in southern West Virginia. The six day field demonstration was conducted from March 24 – April 1, 2011. The ENVIRO-SHALE PROCESS (ESP) mobile unit was designed to treat 42,000 GPD (1,000 barrels) of shale gas waste water. The effluent from the ESP Process was pristine and crystal clear. The effluent was tested and recycled back to a nearby drilling operation. The patent pending process which incorporates proprietary activated carbon technology demonstrated its effectiveness to remove inorganic as well as organic contaminates. The average total chloride influent and effluent concentrations were 160,720 mg/l and 140,400 mg/l respectively. The average total chloride removal % rate was 12.6%. Total Organic Carbon and dissolved carbon dioxide (scaling forming compound) removal efficiencies were 56.2% and 52.9% respectively. The ENVIRO-SHALE PROCESSÕ final effluent was tested and approved for recycling at a nearby shale gas drilling operation; this reduced fresh water needed for fracing and eliminated disposal of the water via deep well injection. LES has developed an innovative approach to extend the life of recycled frac water utilizing the ENVIRO-SHALE PROCESS (ESP). 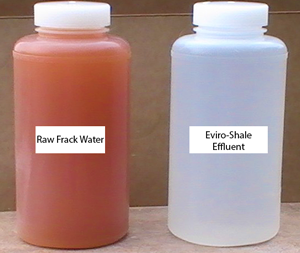 This patent pending process purifies the frac water by removing various impurities (inorganic and organic) thereby extending its effectiveness as a water source for hydraulic fracturing. LES’ proprietary treated granular activated carbon adsorbs organic compounds while simultaneously removing inorganic compounds, such as iron, barium and strontium. The ESP Process is a superior treatment process offering several unique features and benefits: (1) its economical to operate – cheaper than trucking and deep well disposal cost; (2)mobile – it can be operated in the field for Òreal timeÓ recycling; (3) it produces reusable water – it can be recycled for additional fracing and reduce fresh water needs; and (4) significantly reduces the need to dispose of large volumes of frac water via deep well injection. Lewis Environmental Services is under contract to build a second mobile unit designed to process 100,000 GPD (2,380 barrel) of shale gas waste water. If you area Driller and want to discuss your options and review your current recycling practices, give us a call. We can discuss the benefits and potential savings from recycling frac water with the ESP Process. You can stop deep well injection and improve your bottom line.